To view our current inventory of American silver hilt sabers, click here! 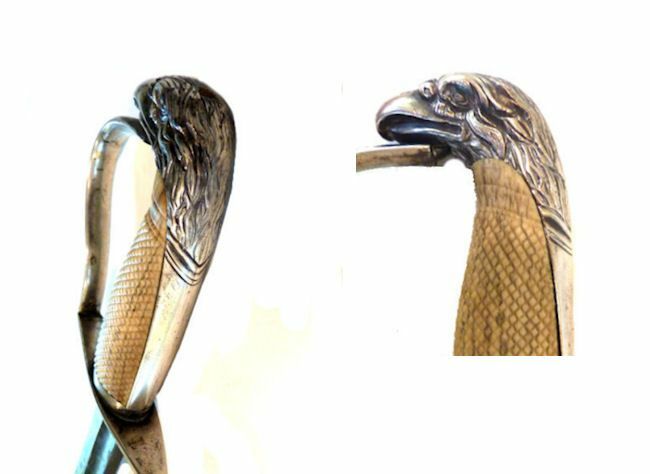 This Outstanding Silver Hilt, Eagle Head Has Been Sold. Thank you! Presented is a very rare example of a Silver Hilt, eagle head saber that is 35 7/8“ long with a checked bone grip, knuckle bow guard, and a blued blade with gold embellishments marked Berger Paris. Clearly, this sword was used in combat as shown by the scars up and down the blade. The pommel is fitted with a distinctively American made,eagle head with heavily chiseled features that are in sharp detail with a prominent turned down beak which continues into the backstrap. The tang comes through the top of the head. The head is hollow, and has a central seam at the front of the beak showing it was made in two pieces. It is heavier in weight than most Philadelphia eagle heads. The entire hilt has stood the test of time with only minor flaws and marks of age in the silver smithing. There is no scabbard. This eagle head is an exact twin to the one pictured on page 239 of “Silver Mounted Swords, The Lattimer Family Collection“ by Daniel D. Hartzler as shown below. THE BLADE'S MARKINGS: The maker of the blade, A. Berger is a little known, but well respected sword maker, who operated in Paris, France in the early years of the Nineteenth Century. There are three references to him in The "American Eagle-Pommel Sword" by E. Andrew Mowbray and there are copies of Berger's advertisements which say he was associated with F. Backes successor to F. Delacour & Backes that appeared in French papers. ON THE OBVERSE: The blue blade is embellished with remaining gilding on the obverse with a fern, an American shield, two spears and a quiver of arrows, and then a second design which is all ferns and floral. Both these engravings remain. Just above the Ricasso, with the gilding lost,are two crossed flags with a cannon and florals at their base and under “WARRANTED”. ON THE REVERSE: Berger over Paris is imprinted on the ricasso, and above that is the same two crossed flags with a cannon and florals. Above and partially gilded is a design of two crossed spears which is difficult to see because of rust. And above, a simple floral design. THE BLADE'S DIMENSIONS & CONDITION: The 1 1/8“ wide blade has a large single fuller 3/4" wide and 20“ long ending 9”behind the tip. The blade's edge is sharp for its entire length, and the false edge is sharp to the fuller. The length of the blade shows six significant scars of combat and other small nicks. There are patches of rust on both sides and roughness. Close-ups of Gilded Heraldic Symbology. Top is from reverse side. International buyers welcome, but must inquire first. You are responsible for knowing the import laws of your country. We have satisfied customers in Argentina, Australia, Austria, Belgium, Bermuda, British Virgin Islands, Canada, Chile, China, Czech Republic, Democratic Republic of Congo, Denmark, Estonia, England, France, Germany, Greece, Holland, Hong Kong, Hungary, Iceland, Ireland, Israel, Italy, Japan, Kuwait, Latvia, Malaysia, Martinique, Mexico, New Zealand, Norway, Nova Scotia, Panama, Poland, Portugal, Puerto Rico, Romania, Russia, Saudi Arabia, Scotland, Singapore, Spain, Sweden, Switzerland, Thailand, Turkey, United Arab Emirates, USVI and the Eastern Caribbean.